Making the proper splices in the proper places on your ropes is the benchmark of a skilled craftsman. Very often, the ability to do a neat job of splicing is placed on the top of the skills list of ropework. Making splices is not really all that hard to do. There are three basic types of splices that are typically made on three-strand twisted rope: an eye splice, a back splice, and a short splice. The basic process in all three splices is to unlay the strands at the end of the rope, then weave them over and under back into the rope to form the splice. In some cases the right knot could do the same job as each of these three splices: a bowline might be used instead of an eye splice; a Sheet Bend, Water Knot or Carrick Bend instead of a short splice, and whipping could replace the back splice. Knots are bulkier than splices. Splices are neater and smaller and not likely to come untied in use. Splices in ropes make the rope secure and ready to go when needed. There are a number of rather complicated splices. The eye splice, back splice and short splice are basic and well suited to the type of pioneering outlined (in this pamphlet.) The splices shown here can be made in any three strand rope (manila, sisal, poly, or nylon). Learning how to make the first tuck on each of the three strands is the key to splicing. The first tuck sets up the pattern for the following tucks and gives the splice a symmetrical appearance. Those first few tucks that you make might look a bit rough, but try to remember that neatness is one of the keys to a well-made splice. Try to prevent each strand from raveling while you’re working with it. Also, you should try to pull each set of tucks tight and with even tension. The rope should maintain approximately 80% of its strength if the splice is made with a series of three tucks on each of the three strands. If after making the first three tucks on all three strands, you reduce each strand to one-half of its fibers and make a fourth tuck, the splice will have a nice tapered look. To learn the technique of splicing, it’s best to practice with a short piece of 1/4″ three strand manila rope. Avoid sisal and plastic rope until you have mastered splicing with manila rope. Even the best drawings of the steps for making a splice can look confusing. The best way to learn how to splice is to sit down one-on-one with someone who is familiar with the techniques and go over each step a few times until you get used to how the strands are woven together. Splicing is not one of those skills that you can do once and then never forget how to do it. It takes a lot of practice. BACK SPLICE The back splice is made to prevent the end of the rope from raveling. It can be used instead of making a whipping. Of the three splices shown here, the back splice is the least used because its bulk at the working end of the rope makes tying some knots more difficult. Unlay more than sufficient to make the splice and spread the strands evenly. 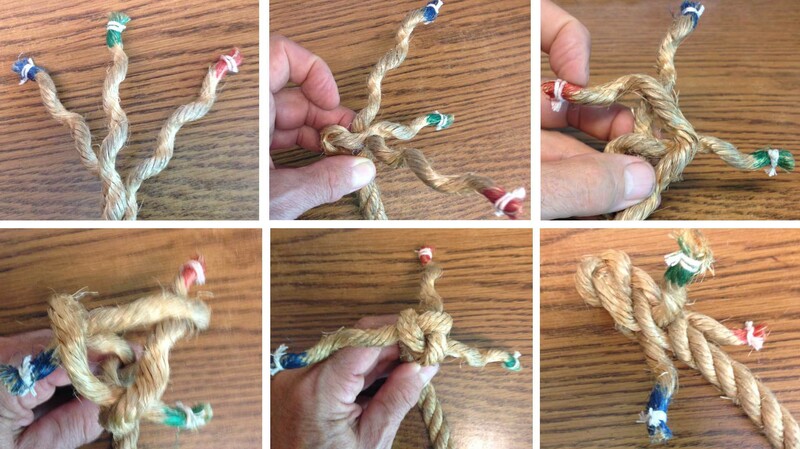 Make a crown knot by bending each end over its neighbor in turn, going the same way round as the lay of the rope. Pull the crown knot into shape. Tighten it on top of the rope. Tuck each end in turn over the adjoining main strand and under the next. Draw tight close up to the crown knot. Continue in this fashion until you’ve made at least three tucks. Draw the ends tight after each round of tucks. Splice a fixed loop onto the end of a guyline. Splice a fixed loop with a thimble in a 10′ rope to form a strop (refer to the “Anchors” section). Splice a rope into an eyebolt at the bow of a canoe. Splice a rope into a tent or fly grommet. Splice the throwing line into a ring buoy at the waterfront. Splice the line into the block of a block and tackle. 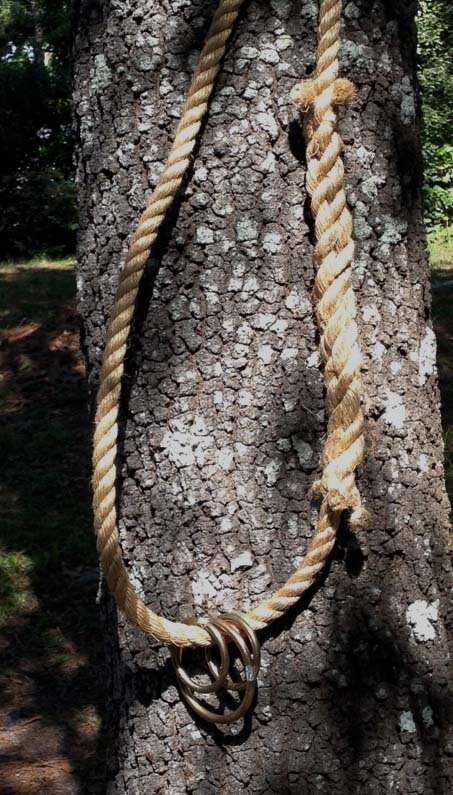 Put eye splices into each end of a rope to be used as a sling. Unlay more than enough strands for tucking. Lay the strands out so there’s one on the left, one in the middle and one on the right. Take the middle strand and tuck it under a strand at the proper distance to form the size eye you want. With the strand on the left go over the strand you just went under, and under the strand behind it. Turn the splice over and tuck in the last strand so that it exits where the middle strand entered. 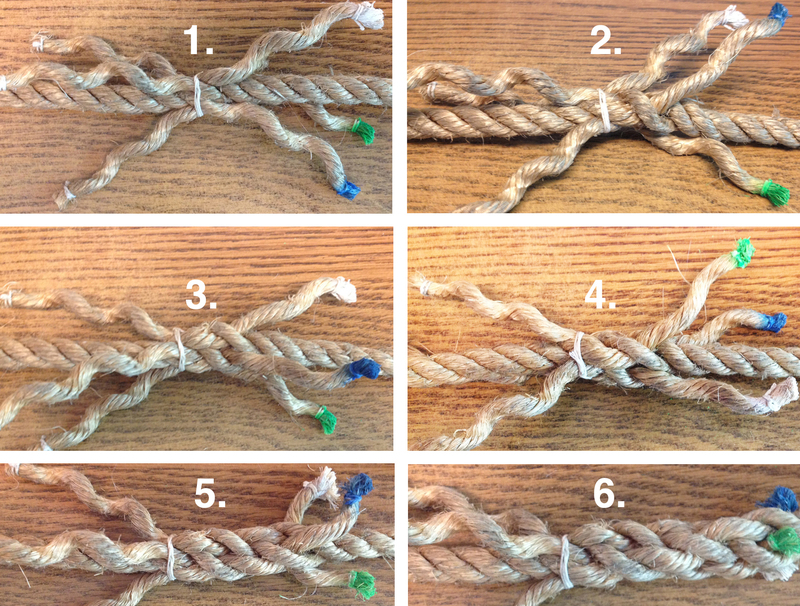 All strands should be coming out evenly at the same position around the rope. Continue to tuck in each strand, over and under. 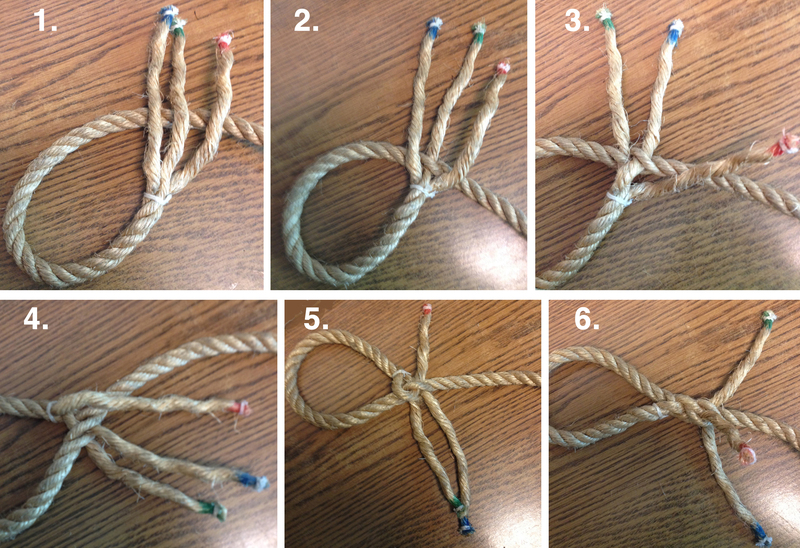 Make a total of three tucks for natural fiber rope, and four tucks for synthetic rope. Splice the ends of a long line that has been cut, or when a frayed or unsafe portion needs to be cut out. Splice the ends of a short length of rope to form a grommet (fixed loop). Unlay the ropes, intertwine the strands, and tie a temporary whipping to hold the ropes together. Tie each strand with a constrictor knot to prevent raveling. Starting with one strand (blue) of the left rope, take it over one of the strands on the right rope, and tuck it under the next strand on the right. Roll the rope towards you and take the next strand (white) in turn. Take it over the strand on the right rope, and tuck it under the next strand. Roll the rope towards you again and take the third strand (green) over the next strand and under the one after on the right rope. At this point, three strands of the left rope should be tucked under two strands on the right rope. Continue by making another tuck with each strand. Continue the process until three tucks have been made with each strand. Remove the temporary whipping and splice the other left ends in the same way. Since you are teaching knot tying skills you might find my instructions on how to tie a Bowline if you are left handed, there is also a link on the article for a printer friendly PDF version you can print and take with you or give to the left handed scouts.